The stone triangle or pyramid represents the 3 degrees in craft Masonry. The 3 points of the triangle represent the 3 Lesser Lights or 3 Burning Tapers which are a part of the furnishings of every Masonic Lodge. The All-Seeing-Eye within the pyramid represents the watchfulness of the Great Architect of the Universe. It reminds us that we are always being watched or observed, and to therefore govern ourselves accordingly while in public, or while in the company of our brethren. Within the points of the triangle are symbols representing 3 Officers Jewels; the Square, Plumb, and Level. These working tools are also representative of the 3 Lesser Lights and their Masonic interpretations. The Rising Sun at the apex of the pyramid is representative of the fact that there are Masonic Lodges in all points of the globe. It can truly be said that "the sun never sets on Freemasonry". The sun also represents the Worshipful Master of each Lodge, so the sun is positioned above the pinnacle of the pyramid and above the Square, or Masters Jewel. The wings represent personal freedom and liberty which is an ideal Freemasons have embraced since the beginnings of our ancient and noble fraternity. Wings are also a symbol which is much embraced by those who enjoy sport motorcycling, and is used in many motorcycle related logos such as Harley Davidson, just to name one example. 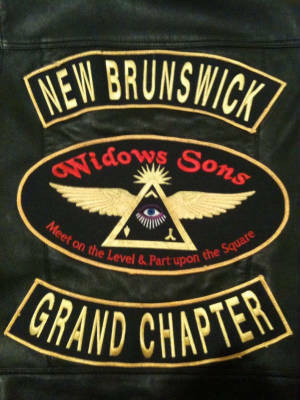 The words "Meet on the level & Part upon the square" were added to remind our non-riding brethren that the Widows Sons are Masons above all, and we should be greeted and treated as such. It is our hope that this will help our brethren to overcome any prejudices or preconceptions they may have regarding those who ride motorcycles. The phrase also stimulates the curiosity of Non-Masons who see our logo and may cause them to inquire about its meaning. This allows us to respond about its Masonic nature and inform them about Freemasonry and our fraternity. The Widows Sons and above text were changed to the color red as red is representative of passion, and reflects our passion towards Freemasonry, the Widows Sons organization, and motorcycling.